In Valencia we are always in the midst of a crisis, and I don’t mean an economic one; although that, too, although it will never be acknowledged-but a cultural one. For years we have been subjected to a situation in which the institutions have seized control not only of cultural management but also of creation. I begin this way because I regard it as necessary to align ourselves with the Herramientas del arte. Relecturas [Tools of Art: Re-readings] project curated by Alvaro de los Ángeles, with the firm proposition of re-reading and reflecting again upon on the players in the art world and the perennially problematic relations amongst them. This is a customary activity of several producers who (still) work from Valencia. A need seems to be felt to begin to criticise what is going to be done, before anything is done. I regard this more as an inevitable attitude than as an obligatory stance. And it is only to recall that Alvaro de los Ángeles has been faithful to this critical spirit for years. The starting point for a reflection has given rise to a procedural project, or a “project like a living organism”, as its curator defines it. Open and unceasing dialogue amongst all participants -the artists Isidoro Valcarcel Medina, Rogelio Lopez Cuenca, and Daniel García, the institution’s manager Ana de Miguel, and the different critics-is one of the curator’s firm intentions to break in this way the customarily close relations between the parties and the challenge of a new type of authorship, that of the curator. The Herramientas del arte. 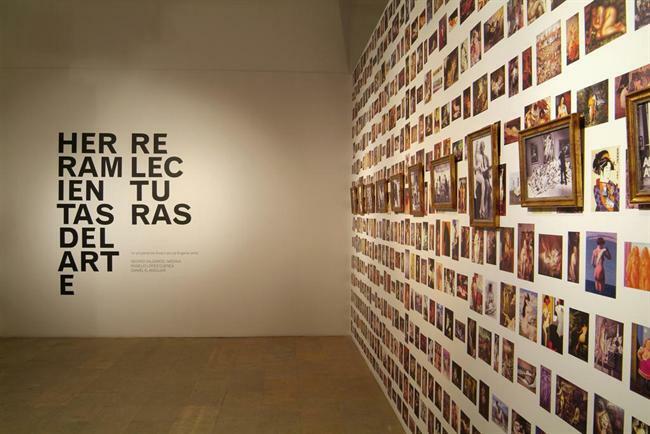 Relecturas show, which remains open until next 30th September, is only one more phase of this open-ended initiative. Previously, a workshop/encounter with Rogelio Lopez Cuenca and Daniel Garcia Andujar was staged at the Valencia’s Polytechnic University, and a blog was launched: www. herramientasdelarte.org, giving online projection to the production of knowledge that has invariably been pursued, in opposition to the aesthetic-contemplative exhibition model. Likewise, a notebook has just been published with a variety of articles by the writers mentioned, and another by Ivan de la Nuez, which was originally entitled Intelectuales en la era de la imagen, [Intellectuals in the Age of the Image] and is now rechristened as En paracaidas o con paraguas. Arte, politica y supervivencia [With a parachute or an umbrella: art, politics and survival]. On the 26th an encounter was held with Isidoro Valcarcel Medina. And lastly, for the closure of the exhibition period; from 23rd26th September, a new series of round-table discussions with artists is to be held and a second publication will be produced with a variety of articles about the current situation of art with respect to the social sciences, in which writers belonging to different disciplines with reflect about the convergence of these social issues with the practice of art. For Alvaro de los Angeles, the tools of art named in the title are “all the technical and conceptual possibilities that may be used to define and question our surroundings, from an instrumental viewpoint, and with an aesthetic aim”. Thus they include, on the one hand, the tool as technique, which allows us to analyse the infinite possibilities of today s technology and the use that the arts may put it to, a matter about which Garcia Andujar has a great deal to say. And, on the other hand they include, amongst the tools in the artist’s hands, the concept or the idea and the driving force of today’s artistic practice. And, tying in with this, special attention is paid to the huge body of social issues which art attempts, more or less decisively, to achieve a new -or renewed- position -certainly a privileged one-to understand and explain, but at the same time to intervene in, society. This, possibly excessive, exercise in extension of the “tool” concept is in fact nothing more than an offshoot from one of the other main lines of this projects: the questioning of the very figure of the artist. In the exhibition, Rogelio Lopez Cuenca and Daniel Garcia Andújar, working together for the first time -and thus delivering another blow to the “author” concept-, have sent up an enormous installation comprising an audiovisual display ad hundred of still photographs extracted from the morass of images about artists made by the mass media. The capacity for summary that they offer is overwhelming. The multiplicity of posters, magazine pages, television commercials, scenes from well-known films, newspaper photographs, etc., concerning artists, museum’s and art professionals which, according to the artists themselves manage to convey the idea that society has of art and its practitioners. But it also shows, perhaps with even more irony, how society uses these images, how it takes advantage of the pantomime of its own creation. Meanwhile, Isidoro Valcarcel Medina shows his S/T (Sobre el arte cultural) [S/T (on cultural art)], a project that began with the mailing of 500 letters to all Spain’s museums, arts centres, foundations, and similar institutions. The letters explain that Valcarcel’s installation was to consist of a huge stand of shelves holding a series of empty cardboard boxes to symbolise each of the institutions that received the letter. This representation would be made clear to the public by the inclusion of a label bearing the name of each one. Then the letters asked the manager or manageress to defray the cost of the cardboard box: six euros, though explaining that the box would be included even if the money were not paid. But a red stamp would distinguish those that had been paid for. The upshot was that only a small handful of boxes appear with the red stamp. Valcarcel Medina’s aim with this ironic game with art institutions was to speak of the present moment in the relations of art to art institutions, a relation that the artist believes is characterised by an increasing institutionalisation of art. To carry on with the image of the project as a living organism, we might say that it is a highly developed creature, with a workshop, a blog, an exhibition (with a rich documentation zone), meetings, and publications that spawn many questions concerning the state of art today, the role of the artist, the tools of art, cultural policies, etc. It is a very complex form that may be studied from numerous viewpoints. But it is also true that this sort of project needs even more, especially with regard to its exhibition phase. The selection of the three artists is very striking, but for such a project to succeed in conveying all its complexity calls for more resources, I repeat, especially in the exhibition. Naturally, as we have said, it is a good go outside the centre and involve the university in the life of the city. But one would have welcomed a greater variety of artists and proposals. At all event, it is a praiseworthy initiative, and the more so in staid Valencia, showing courage and ability to make an exhibition into a space that works on the two key tasks of cultural production today: one, to transform an exhibition project into a mechanism of production and knowledge, and two, the work of the artist as a researcher.